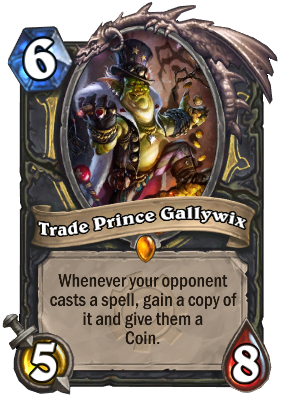 Gallywix believes in supply and demand. He supplies the beatings and demands you pay up! Bought the wild bundle today and opened him as my first golden legendary. If you thought your opponent didn't have enough mana, no worries. HE FINALLY FOUND HIS CAT! This guy is the reason i won against Heroic Malchezaar. Pay up Malchezaar, its 20 Warlock spells to enter this party. 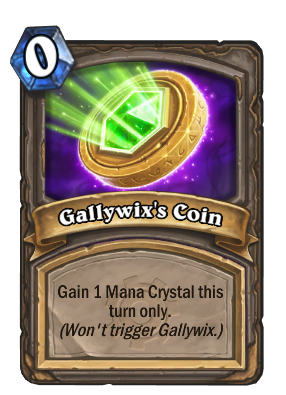 A bit sad that this card will leave standard soon, it's really cool! I just got a gold one of these... Keep? I do not have a normal copy but cannot see many solid decks using it. Dust it it is basically the most fun card in the game (for me) but it completely lacks sense in using in a deck because even if u manage to get a good spell like an avenging wrath u would give ur oponent free mana wich could mean a crazy OTK combo so my recomendation is to dust the gold one and use the dust to make a kazakus or a fandral wich are really good crads for both competitive or for funny casuality. Hope this guide helped u.
Amazingly powerful card - so awkward to deal with the opponent will most likely try to play around it by using no spells. It won me many game in rogue, and actually made it fun to play a controlish kind of deck. You open your legendaries first in a pack?